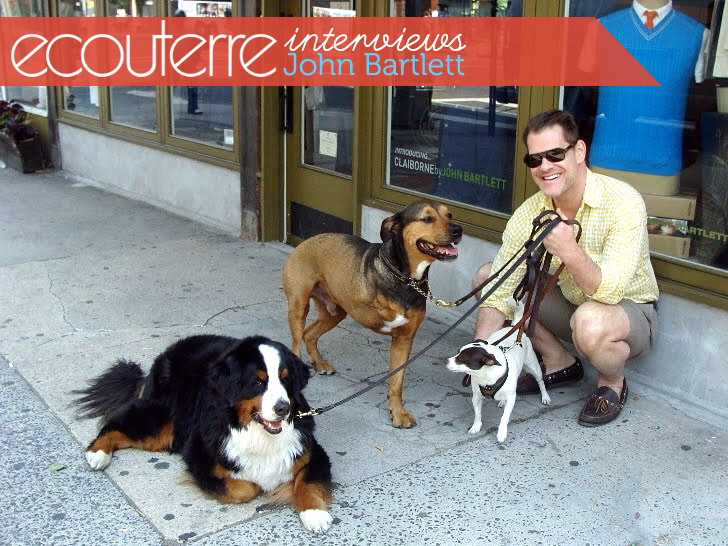 Fashion designer John Bartlett is best known for his classic American garments, but when he’s not creating impeccable clothes, he’s passionate about spreading awareness about animal welfare. We recently caught up with Bartlett at the Healthy Food in Fashion Gala, and got a chance to talk to him about why he chooses to embrace cruelty-free fashion and the The Tiny Tim Collection, his latest line of clothes that benefit organizations that rescue dogs from kill shelters (just like his own 3-legged best friend Tiny Tim) and find them new homes. Read on for the full interview! Fashion designer John Bartlett is best known for his classic American garments, but when he's not creating impeccable clothes, he's passionate about spreading awareness about animal welfare. We recently caught up with Bartlett at the Healthy Food in Fashion Gala, and got a chance to talk to him about why he chooses to embrace cruelty-free fashion and the The Tiny Tim Collection, his latest line of clothes that benefit organizations that rescue dogs from kill shelters (just like his own 3-legged best friend Tiny Tim) and find them new homes. Read on for the full interview!